Structured Cabling RI MA - Communications Unlimited, Inc. Your technology infrastructure starts with your structured cable system. Communications Unlimited, Inc. has a dedicated and qualified team of low voltage and network structured cabling installers who are licensed and factory trained in the states of RI and MA. We are a BICSI partner and our technicians are trained and certified in Hubbell, Tyco/AMP, Molex and many other structured cable products. These affiliations allow us to offer up to a 25 year warranty. We have installed Network cabling on projects of many sizes and complexities in RI and MA. Kent County Memorial Hospital Ambulatory Services Center, Warwick, RI. Dell Computers Foundry Building, Providence, RI. Swipely, Dorrance St., Providence, RI. Tufts Health Care, Watertown, MA. Poliquin Performance Center, East Greenwich, RI. Tarbox Toyota, North Kingstown, RI. 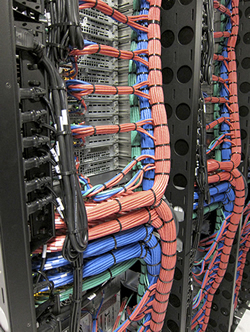 Contact us today for your structured cabling needs. We service RI and MA.